Use console interface and GUI. 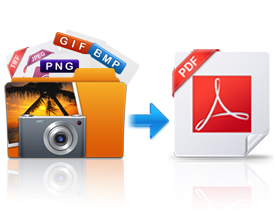 Image to PDF Converter is an easy-to-use tool for converting images to PDF files. It supports most of popular image formats, e.g., TIF, TIFF, JPG, JPEG, GIF, PNG, BMP, PSD, WMF, EMF, PCX, PIC, etc. This application is independent of a third-party PDF reader or creator. 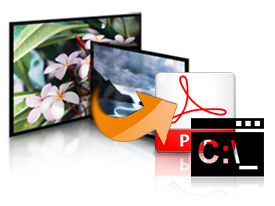 For converting image to searchable or editable PDF, you can use Image to PDF OCR Converter. Compatible with Windows 98/ME/NT/2000/XP/2003/Vista/7 of both 32 and 64-bit. Support various image formats like TIF (TIFF), JPG (JPEG), PNG, GIF, PCD, PSD, TGA, BMP, DCX, PIC, EMF, WMF, etc. Support unattended conversion for files in specified directories. No need for other PDF reader or creator software in conversion. Combine multiple images into one PDF. Able to combine files in one directory to one PDF. 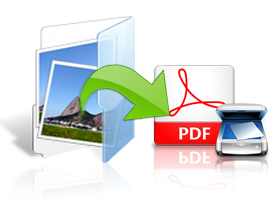 Convert Multi-page image file to PDF. Sort files by name for batch conversion. Customize description of created PDF, such as title, subject, author, and keywords. Add bookmarks to converted PDF. Able to insert or append newly converted PDF to existing PDF. Automatically preview converted PDF with an associated application. Support command line operation which is useful for script inclusion or manual use. Specify any resolution for converted PDF. Add bookmarks to a specific page. Support wildcard character arguments for batch conversion, e.g., *.tif, a*.jpg, etc. 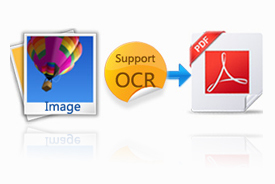 Image to PDF OCR Converter provides accurate OCR results for recognizing characters in images. It is based on and has all the features of Image to PDF Converter. Support scanned image formats like TIF (TIFF), JPG (JPEG), GIF, PNG, BMP, PSD, WMF, EMF, PCX, PIC, etc. Make searchable PDF from images with OCR by command line. Create searchable PDF directly from scanned images like TIF, JPG, PNG, etc. Image to PDF COM is development component COM for creating PDF from image to PDF. Its functions are now included in PDF Editor Toolkit. Click to read the manuals: DLL Library Manual and OCX Library Manual. Provide code examples include in package in language VB and VC++. Support creating bookmarks in PDF. Support more than 40 image formats. Able to specify page size. Use Standard 14 Fonts to support basic text output. Support basic Line and Rectangle drawings. Append PDF to an existing PDF file. 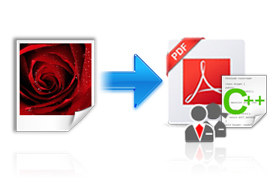 Convert multi-page image file to multi-page PDF. Edit PDF description, such as title, subject, author and keywords.